Several sites are available, within the Park 30-55, to meet your needs at short or middle term, as much for office spaces as for warehousing purposes. 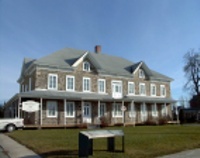 This field stone structure, of 80 feet length by 40 feet width on two floors, dates back to 1774. The last major renovation was undertaken back in 1993, costing around $325,000 and involved, among other things, isolation of premises, plumbing and electricity. This model location is an ideal choice of premises for professionals and consultants working in Parc Industriel et Portuaire du Centre-du-Québrec and Park 30-55, because of its localization in the Bécancour sector, a few steps away from these sites. Right now, we are proposing office spaces of various sizes, from 120 to 1200 square feet, with access to a very beautiful communal 350 square feet conference room nicely decorated. The building is equipped with two functional restrooms, men and women, a central vacuum cleaner, air conditioning and parking spaces. This 20 000-square-foot structure was built in 1989. It is a multi-purpose building, lending itself to offices, businesses, industries, as well as storage. Located at 1030 Port-Royal Boulevard in the City of Becancour, it is only a stone’s throw from the Laviolette Bridge and Highway 55. To better serve its clients, the location is divided into sections, featuring loading docks, 14’ x 14’ garage doors, as well as a spacious area at the rear and parking area at the front. 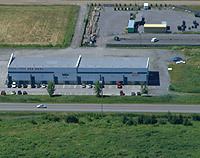 Built in 1989, this structure is located at 17755 Gauthier Street in the City of Becancour’s 30-55 Industrial and Commercial Park. The building occupies a surface area of 8400 square feet, with 700 square feet dedicated to office space and 7700 square feet for operations. 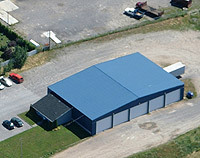 It features 11 14’ x 14’ garage doors, as well as a loading dock.